The airwaves today are filled with electronic waves. Forget about TV signals; that was yesterday. Today we have not only TV, but AM and FM radio waves, microwaves, infrared, short-wave, cordless, Wi-Fi, weather radar, and you-name-it. This is aside from visible light waves, ultraviolet radiation, X-rays and even gamma rays, not to mention gravitational radiation. We may not be able to see many of these, but they are everywhere around us, filling all the available spots in the frequency spectrum. What effect they have on us I have no idea, but I am sure we will eventually find out. Anyway, that is not what I want to discuss. I am going to talk about our thought-wave spectrum, which at times seems just as filled. There are often swarms of thoughts in our mind and they can't all be ours, or can they? And does it matter? Of course we have the good thoughts and the thoughts we need to pilot our bodies and get around, but what about all those other thoughts that just seem to come out of nowhere? What are we supposed to do with them? It's not as if most of these extraneous thoughts are about Timbuktu or rocket science. Most of them are quite recognizable as connected to us, either someone we know, something we did or like to do, or whatever we really don't want to think about at all. I am talking about all the thoughts that we are obviously connected to, however distantly. It is kind of like my Facebook Chat list, where names come up of people I have not spoken to in a long time or maybe only ever once? Where do they come from? Are they reading my blog and where did Facebook find them? No matter, but what about the swarm of thoughts we often have around our head all day? How are we supposed to deal with them? Do we accept every thought as ours and apologize to ourselves if it is gnarly, one that supposedly reveals something about how we feel? And do we really feel that way? Talk about answering all our emails, how on earth are we to respond to the quadrillion thoughts we have each day and do they even deserve an answer? They can be like an incessant rain beating against the windows of our mind. If you think I have all the answers to these questions, you can stop reading right now. I don't. I am calling for a discussion, not giving you a lecture, but I have thought about all of this. We know that, aside from the onslaught of sunlight each day (and all of the various other information riding the tides of the solar wind), that there are magnetic tunnels connecting the sun to earth that funnel information as fast as light can travel. Perhaps there are similar thought tunnels connecting us to any other person, both friend and not-so-friendlies. Does that information thought-express also use such tunnels? Are they real-time windows into each other? Are we connected to one another so that if you are having trouble with something I said or doubting my character in general (or whatever), does that thought appear to me too in the form of a doubt? And what am I supposed to do with such a doubt? Entertain it, refute it, ignore it, or take it to heart and be upset by it? Is there a RSVP connected to each thought or are we free to just zap it with our built-in thought zappers? The answers to all these questions are literally up in the air. I can only tell you what I do in these situations, what I think and understand is going on. For one, I believe that any two of us are very much connected by our "thought tunnels," and that our thoughts of one-another travel at thought-speed, which is probably as fast as the speed of light. For example, if you are having a hard time with me, I get it. Whether I ignore it, respond, or react to it depends on how thin a skin I happen to have that day. I am fairly thin-skinned, I am told, so I probably know at least something of what you think about me, if and when you think of me at all. And perhaps vice-versa. If it is someone close to me or someone with whom I have had an encounter (good, bad, or indifferent), then you have an express lane to my mind, open and accountable. We are on the same wavelength, at least for a time. If you are twisting in the wind over something I said to you, I am right there with you or at least can feel it. The real question is how do I respond? Now, if I react instead of respond, we both are in trouble. Hopefully I do my best to respond to negativity with understanding, understanding that it is only negativity, and not really anything personal. You are having a rough time and I am currently in that equation with you. As you come to mind time and again, I acknowledge you and try to keep in mind all the good I see in you, and understand that right now you (and we) are going through some turbulence. In dharma terms the technique to use in these situations is what is called Tong-Len, which is a practice where we put ourselves in the other's place. We acknowledge the pain and trouble that you (or we) are experiencing together and I do my best to send in return all the kindness and compassion I can muster, which may at times not be all that much. As a car mechanic once said to me, with meaning, "I will do my best; more than that I cannot do." What I do my best NOT to do is to entertain the bitter or hard thoughts and hitch a ride on them so that they become a train of thought rather than an isolated instance of a thought. Once we have a train of thought going, we are recording karma real-time and digging a groove on that issue in our mind, a groove that not only can be painful at the time, but that will have to be aired and healed somewhere farther up the road. After all, that is what karma is about. I believe and know that there are, at times, tremendous struggles going on in our mind between ourselves and, let's say, another person. Just as we have joy when we meet some folks for the first time, so do we have turmoil and gnashing of teeth with others. As they say, "It is permitted." It goes on and sometimes you or I are on one end (or the other) of a see-saw reaction that is no fun for either of us. Often someone will come to mind or even more often there is no name, just a kind of invasive mini-vortex that darkens or obscures, but takes my attention. It is almost as if a small window opens and I feel something there in a corner of the mind. It can be neither good nor bad, but it often appears as a narrowing, a dimming, almost a mini-headache at times. Instead of focusing on this and strengthening this, I relax and try to be accepting, allowing it to dissolve if it will. Sometimes I will bring to mind one of my teachers or someone I care very much about and rest in that. I can feel the tightening loosen and then fade away. This has to be one of those mind tunnels I was referring to. I am curious what some of you reading this have to say as to how you deal with all of this in your life. I will close by mentioning another method of handling thoughts used by some advanced meditators. I am not trying to teach this method, but only to roughly describe it so that you at least are aware that it exists. In this method we don't even bother to unwrap the message in the thought, what is called its content – what the thought is about. Instead, at the very appearance of the thought, as it arises, the meditator looks directly at, not its content, but what is called the "true nature" of the thought. I won't try to describe what True Nature is all about because it is kind of indescribable and can take years of practice to learn, but I can say this, which might help give you some idea. Just as waves and the ocean the waves appear in are both water, so thoughts and the consciousness they appear in are both mind, and share a common nature. As waves are to water, so are thoughts to the mind. Thus the true nature of the mind and of thoughts that appear in it are one and the same. Advanced meditators can look at this common nature of a thought as it arises and immediately that thought is appeased and sinks back into the water from which it came, the mind -- something like that. I said that I would try to give you a rough idea. Now this method is not all that easy to put into words, and it is much harder yet to realize in actual life, so I am told. I just thought some of you might like to know about this technique. It is part of what is called "Insight Meditation" of Vipassana as well as Mahamudra Meditation..
Now, how about talking about your view on conflicting thoughts and how to deal with them? 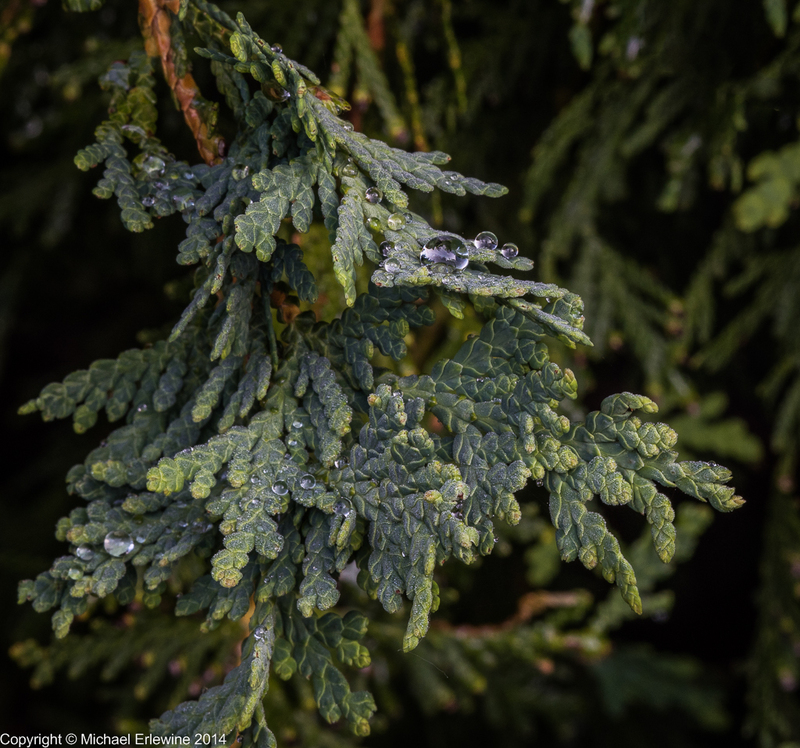 [Photo taken of a cedar branch yesterday."